You can use EditPad Pro's spell checker in two ways. The "Spell Check", "Spell Check Project", "Spell Check All" and "Spell Check Selection" items in the Extra menu will point at each misspelled word in the current file, all files in the current project, all files in all open projects, or the selected part of the current file. For each word, you can choose a replacement from a list of suggestions, type in another replacement, ignore the misspelled word, or accept the word as properly spelled. Live Spelling, on the other hand, will mark each misspelled word as you type, without asking you to correct it. You can correct your mistake simply by retyping the word, or double-clicking it to use the spell checker on just that word. In the screen shot below, you can see both live spelling and the traditional spell checker in action. A unique feature of EditPad Pro's spell checker is that it works together with the syntax highlighting. The spell checker will only check the relevant parts of the file. E.g. when editing an HTML file, EditPad Pro will check the text of your web page, but skip HTML tags and scripts. When programming, the spell checker will check comments and strings, but skip programming statements. This works with any file type for which there is a highlighting scheme, and you can even create your own. Important: EditPad Pro will only detect that you have installed a new dictionary when you start it. If you install a dictionary while EditPad Pro is still running, it will not appear until you have closed the application and restarted it. You need to use File|Exit to completely shut down EditPad Pro. As long as the tray icon is visible, EditPad Pro is still running. 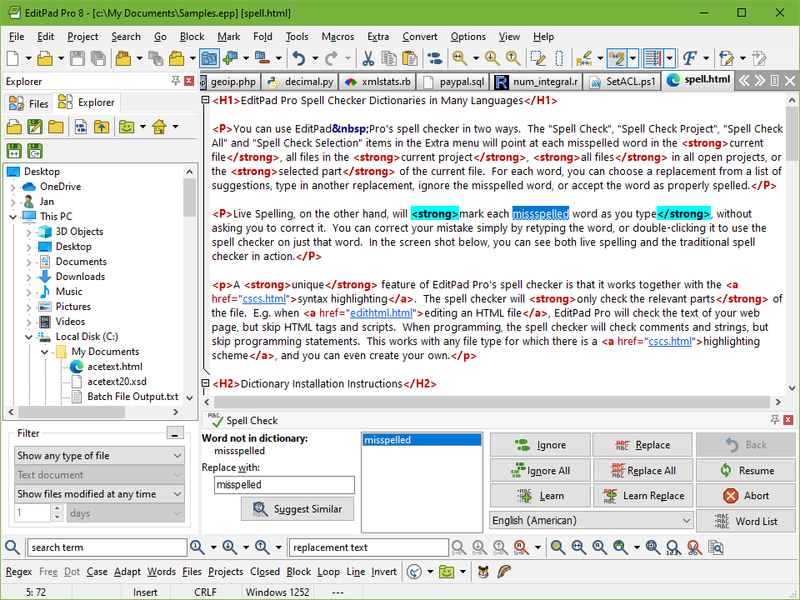 The same dictionaries are also used by the spell checker built into HelpScribble and AceText. These dictionaries will only work with the full version of EditPad Pro. They do not with the free evaluation version. "I write metadata for a state geological survey and EditPad Pro allows me to do this with ease. Many projects require multiple metadata files, so features such as tab-switching between multiple files, save all, spell-check all, multi-file comparisons and statistics, and within-page bookmarks are wonderful to have and use in a text editor. Keep up the great work!"